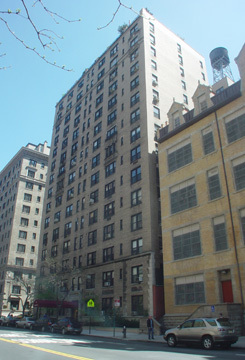 This pleasant 16-story building was erected in 1928 and converted to a cooperative in 1970. The building has 108 apartments. The beige-brick building has an Italian Renaissance palazzo-style facade with terracotta swags on the first floor, two bandcourses and some decorative window reveals. The entrance has very nice bronze doors that lead into a nice, L-shaped lobby. The building has a doorman and a concierge and sidewalk landscaping. It has consistent fenestration and permits protruding air-conditioners. This neighborhood offers convenient public transportation at 86th Street and excellent shopping as well as many interesting restaurants. Riverside Park is one block away.